Greetings Love Bunnies! I am pleased to share with you this mix of r&B, soul, electronic chill, with some hip hop. This mix was done by @KDFA. Find him on Twitter and Instagram with that handle. There is no tracklisting at the moment. Sorry bunnies. Follow me on Breaker (social podcast app) @ Rach. Download the 1indienation iPhone app and subscribe. Greetings love bunnies! Here is a Progressive House, Trance and Downtempo mix from @Barnstormed on Twitter. Subscribe on iTunes and download the 1indienation iPhone/iPad App! Greetings lover bunnies! Sorry for the hiatus. I have been busy with the holidays and no personal space to record! My bad. I am glad you are still with me! I love recording, even when I am sick! I have a little bit of a cough and my voice isn't the best. So bare with me. 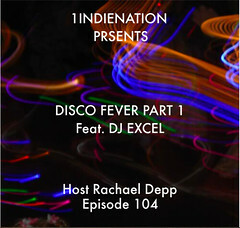 This episode 100 is DEEP HOUSE mix by DJ DAZ // LA. No tracklisting! Just enjoy the tunes. APPS: HQ, Bossjock jr, NYC House, Hey! Vina, Feud Live, Word Cookies, and don't forget to download and support the 1indienation podcast with the iPhone app!